More than 60 environmental groups want EPA Administrator Scott Pruitt to maintain approaching deadlines for oil and gas operators to cut their emissions of methane. Representing conservation, health, labor and even faith groups, they sent a letter this week to Pruitt. They’re asking he keep in place the Obama-era standards requiring oil and gas companies to focus on methane leaks. Pruitt, the former Oklahoma Attorney General has the agency reviewing the New Source Performance Standards as part of the EPA’s reconsideration of several Obama administration rules. 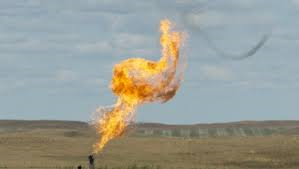 Pruitt has promised the oil and gas industry the June 3 deadline for the methane rule will be postponed. If it happens, the 60 groups say they will take the EPA to court. “This stay will increase health risks for numerous Americans living in close proximity to wells and other facilities, which will emit significant amounts of additional hazardous and smog-forming pollution that would otherwise have been reduced,” the groups wrote. “The stay will also add thousands of tons of methane, a highly potent greenhouse gas, to an atmosphere already overburdened with heat-trapping pollutants. The oil and gas industry contends the rules are expensive and duplicative of existing state and industry efforts. The U.S. Court of Appeals for the District of Columbia Circuit delayed the lawsuit while the administration reconsiders the rule. Who signed the letter? Such groups as the Natural Resources Defense Council, the Center for Biological Diversity, Sierra Club, Environmental Defense Fund, PennFuture, the Ohio Environmental Council and the Wyoming Outdoor Council. There were also health, labor and faith groups such as Physicians for Social Responsibility, Interfaith Power and Light and the Utility Workers Union of America, AFL-CIO.